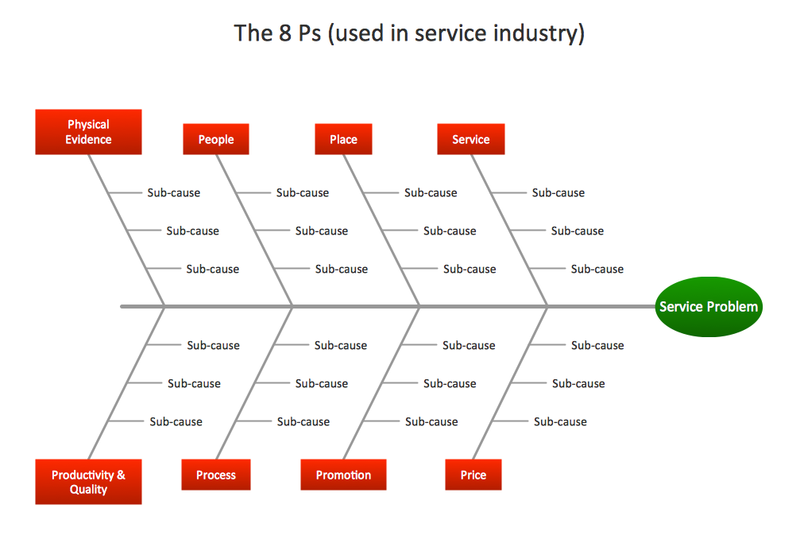 A causal model is an abstract concept, that describes the causal mechanisms of a system, by noting certain variables and their influence on each other, in an effort to discover the cause of a certain problem or flaw. 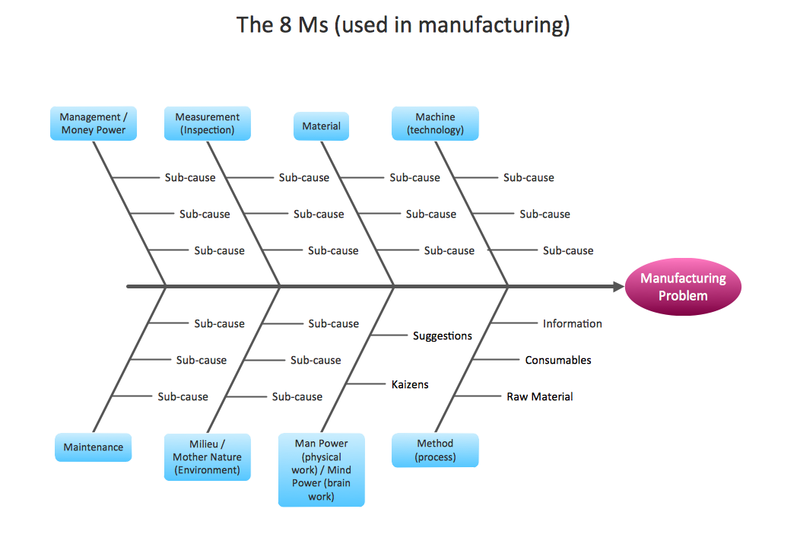 This model is presented in diagram form by using a Fishbone diagram — also known as a Cause and Effect diagram, Herringbone diagram or Ishikawa diagram, the latter name referring to the inventor of the technique, Kaoru Ishikawa. The fish-themed names are used due to the visual arrangement of the numerous variables, designed to represent the ribs of a skeletal fish, so that arrow directs into a central spine whereupon the main problem is placed where the head would be. 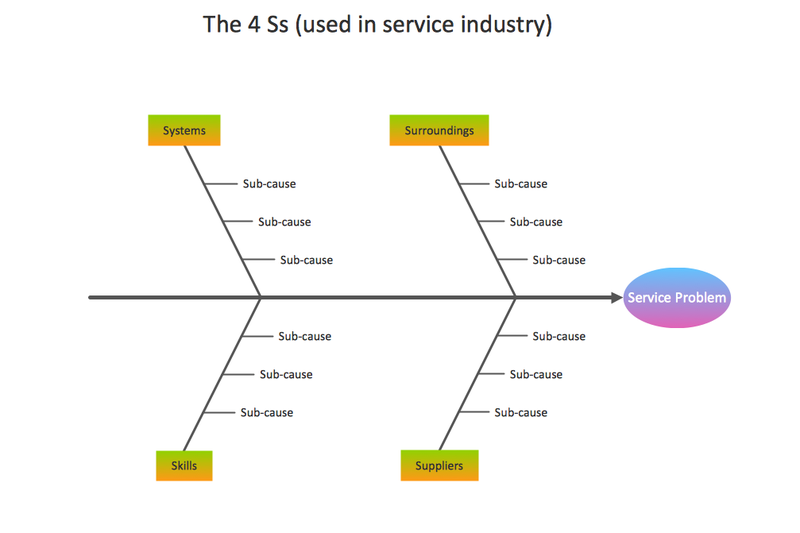 all affecting the overall problem in one drawing for the further analysis and problem solving. ConceptDraw DIAGRAM diagramming and vector drawing software enhanced with Fishbone Diagrams solution from the Management area of ConceptDraw Solution Park helps you create business productivity diagrams from Fishbone diagram templates and examples, that provide to start using of the graphic method for the analysis of problem causes. Each predesigned Fishbone Diagram template is ready to use and useful for instantly drawing your own Fishbone Diagram. 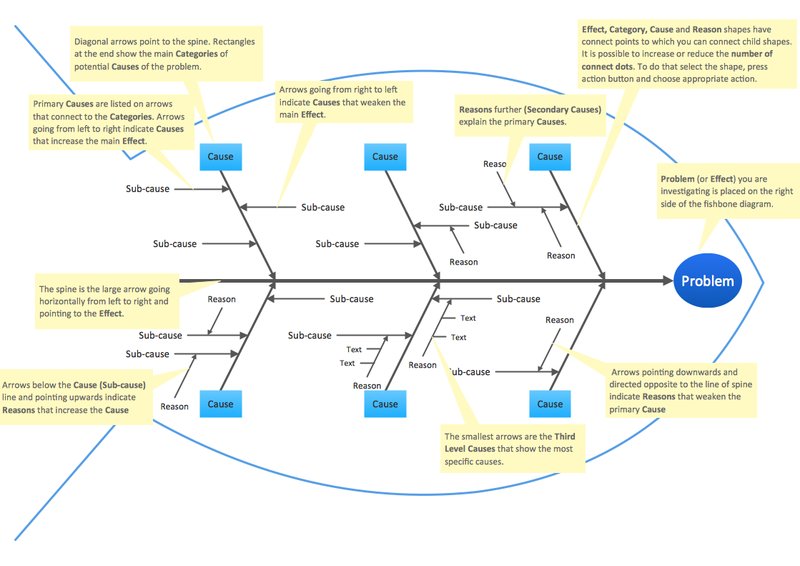 The Fishbone Diagrams Solution from ConceptDraw Solution Park extends ConceptDraw DIAGRAM software with the ability to draw easy Cause and Effect diagrams. 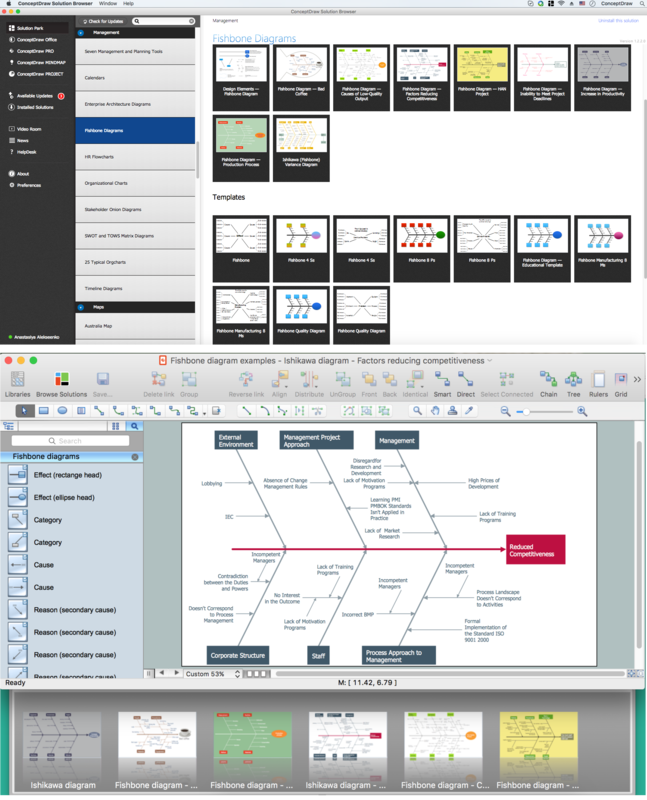 It includes variety of templates for ConceptDraw DIAGRAM and also for ConceptDraw MindMap giving you wide opportunities for professionally brainstorming causes. Templates let much simplify your work for drawing, but if you want to draw your diagram at new blank ConceptDraw document, you can also do this using the Fishbone Diagrams library of vector stencils. 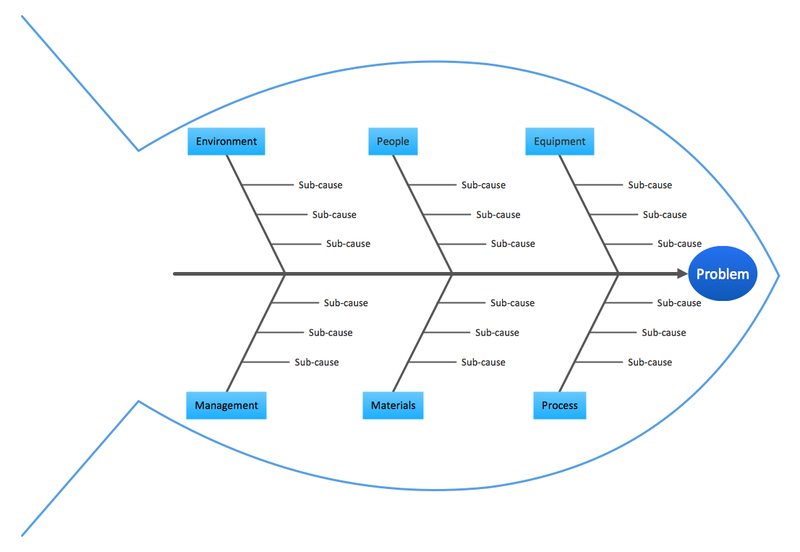 The Fishbone Diagram template and sample you see on this page were created in ConceptDraw DIAGRAM using the powerful tools of Fishbone Diagrams Solution. An experienced user spent 10 minutes creating each of them. Use the Fishbone Diagrams Solution for ConceptDraw DIAGRAM Solution Park for fast, easy and effective drawing Fishbone Diagrams.